At this point I should be used to crossing countries in matter of hours, but, no, it still surprises me a lot. Another 5 to 6 hours in the car with our lovely playlist and some pee stops, we went from Marienburg (Alūksne) in Latvia to Vilnius in Lithuania. We arrived to vilnius late in the afternoon and my first impression of it, was it looked way too much like home. Well, like São Paulo. A grey skyline with big buildings and a river in the middle, but, this image changed later on. We found the hotel Rummis, which we booked the day before for 55 EUR for two nights (without breakfast), to be not on one of the best neighborhoods of the city, in the words of the receptionist. Also, parking was not included, but luckily there was a parking lot just in front of the hotel for 3 EUR/night. We didn’t have any problems with the location though. The room was ok for the price. We had two big beds, one really small TV with no options for international travelers and a bathroom which leaked to the bedrooms carpet. As two good foodies that we are, the first thing we did was find somewhere to eat. We spotted a shopping mall with no name and found the best restaurant: Can Can Pizzeria. It looked really chic from the outside, but we paid 17 EUR for a garlic bread + chilli con carne + calzone + Mexican special + 3 beers + flavored water + small dessert. That´s extremely cheap!!! My view of the city changed completely as we took the free walking tour in Vilnius. As all of the countries we’ve been so far the landscape is amazing, the streets are so clean, there is free WiFi everywhere and the history is unbelievable. Vilnius also has around 64 churches, from which 28 are in the old town. 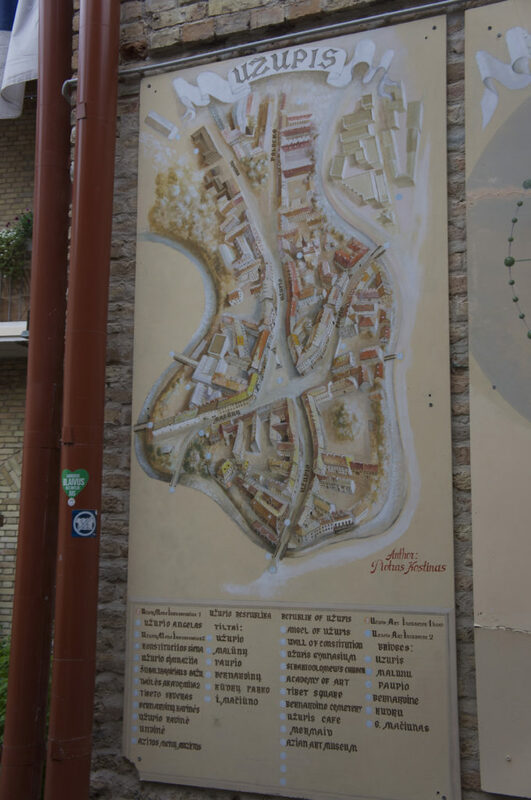 In the city center you can also find a wall with small pieces of art, numbered. 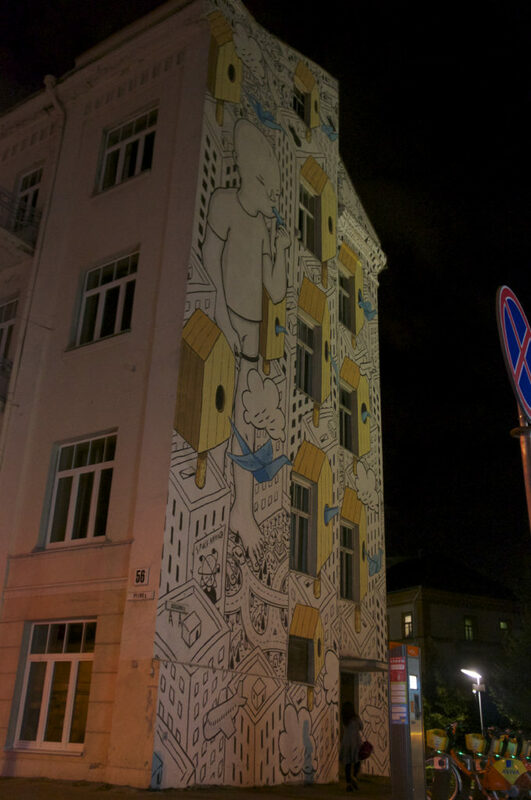 The Literatu Street Project works as sort of a memorial for the Lithuanian arts. The nightlife of the city was also really surprising. Loads of people on the street bars, having fun and enjoying life. We also discovered the Beer House, where we tried several beers (with a really good price: 2,90 EUR the big one) and the national snack “Zepellin” made of mashed potatoes and bacon (2,90 EUR). 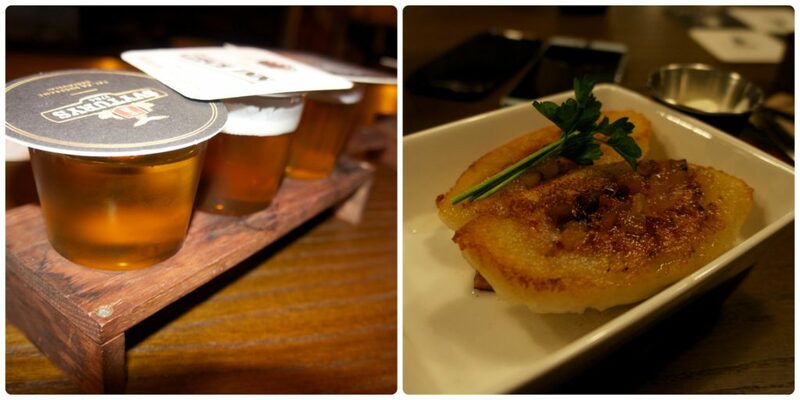 Beer, fried potato and bacon, what more can you ask for? 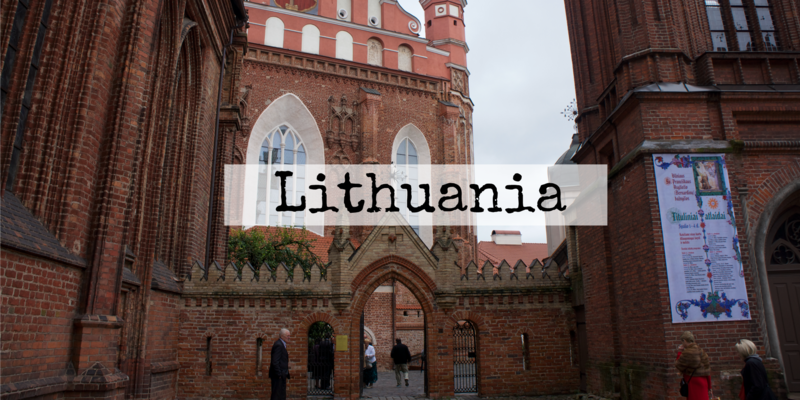 But, did you know Vilnius has a whole other country inside of it self? Sort of like the Vatican? Yeah! And it is called Užupis. Smile all the time – Just be happy! Don´t hurry up – Enjoy Life! Appreciate art – in all it´s forms! Watch out for the river – It has it´s own wishes! Užupis also has the best constitution I have seen so far. 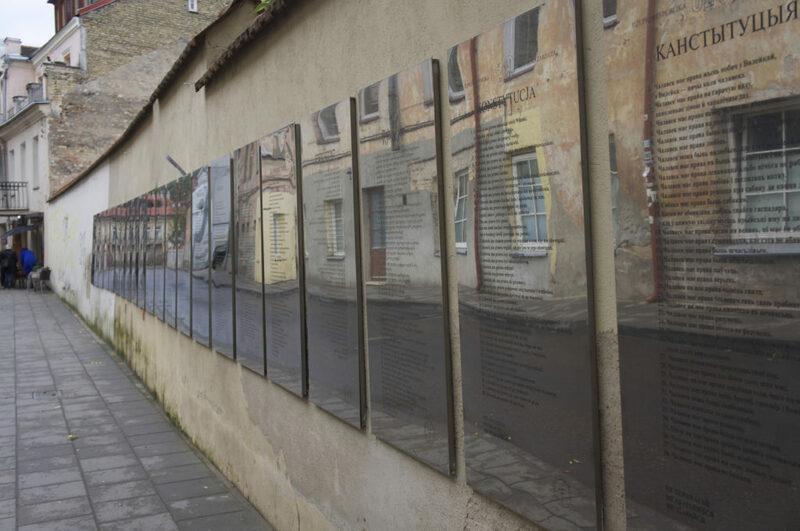 It was written by Romas Lileikin and Thomas Chepaitis, two artists from Vilnius and has been translated to several languages and put into mirrors so that 7.000 inhabitants can see the constitution was made for them. It declares 38 articles and 3 mottos, beginning with: “Everyone has the right to live at the river Vilnia, and the river Vilnia has the right to flow past everyone.” and “Everyone has the right to hot water, heating in winter and a roof over their heads.” and ends with the motto “Don´t give up“. The Parliament building is the Café Užupio Kavinė (“Café of Užupis”), where the Constitution was laid down on a bronze plaque for the first time and the independence day is celebrated every year on April’s first, and I guess you can see why! This small space really surprised me on an amazing way! The Castle of Trakai is situated in an island around 30km away from Vilnius. It was like a 20 min. ride with the car, but I’ve been told it is also easy to reach by train and bus. Its is a nice day get away if you don´t want to stay just in vilnius. The Castle is surrounded by an lovely green park, water (of course, it is an island after all! 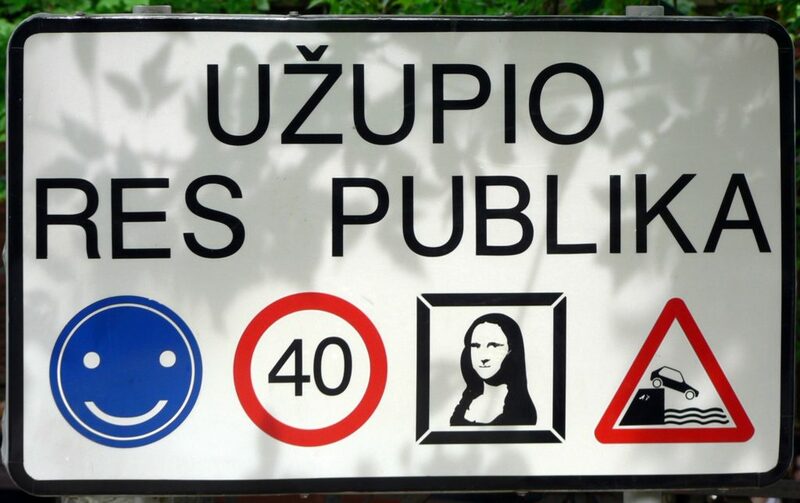 ), several restaurants, souvenir shops and parking spaces from private homes, where elderly ladies and gentlemen sit on the entrance and invite you to park by them for 1 or 2 EUR. 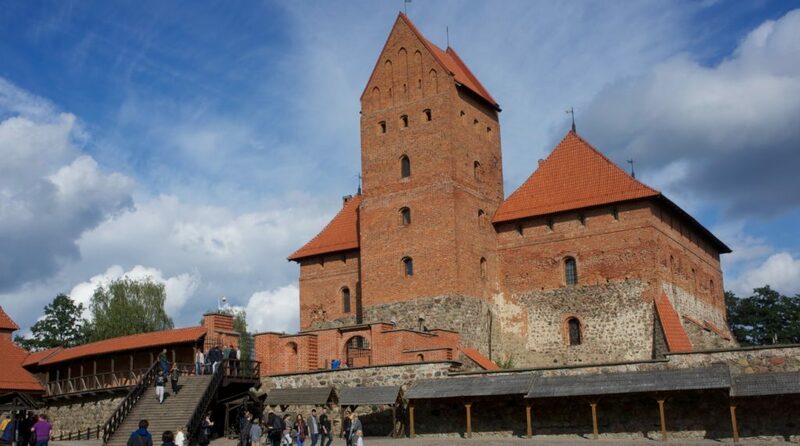 To go into the castle of Trakai itself, there is a fee of 6 EUR per person. Inside you can visit an exhibition about the history, go up and down the towers, go the souvenir shops and even take some archery classes (costs extra). But, the place is really cute and i would definitely recommend a visit. You can do a picnic on the park and enjoy the view on a lovely sunny day! And from here we go to our last stop, where the second world war started! Can you guess where it is?